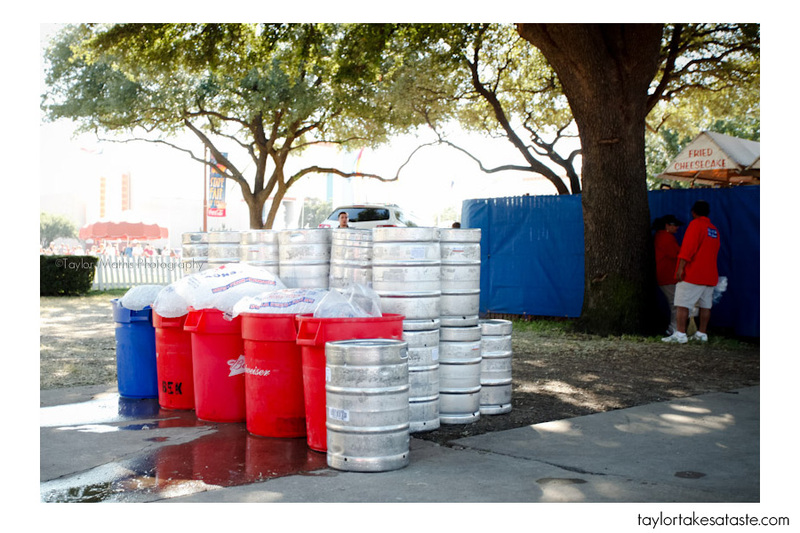 Welcome to Week 5 of the Tailgate Tour. 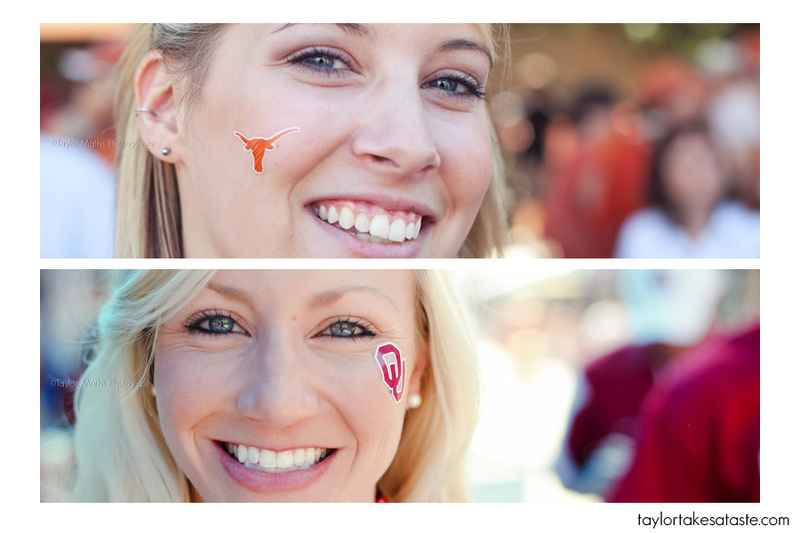 This week I am bringing you the annual battle between The University of Texas Longhorns and the University of Oklahoma Sooners. This was the 105th meeting between these two teams in a rivalry that goes back to 1900. 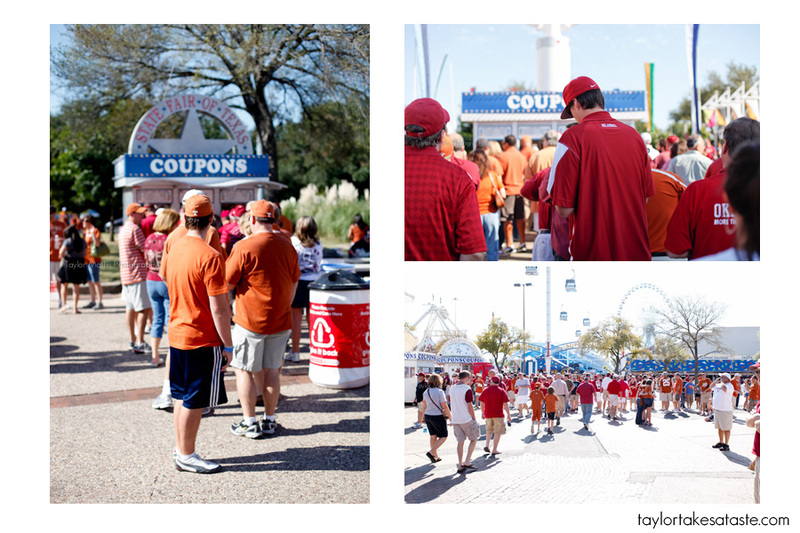 The game is played in the Cotton Bowl on the fair grounds of The State Fair of Texas in Dallas. Here is what I discovered on game day. 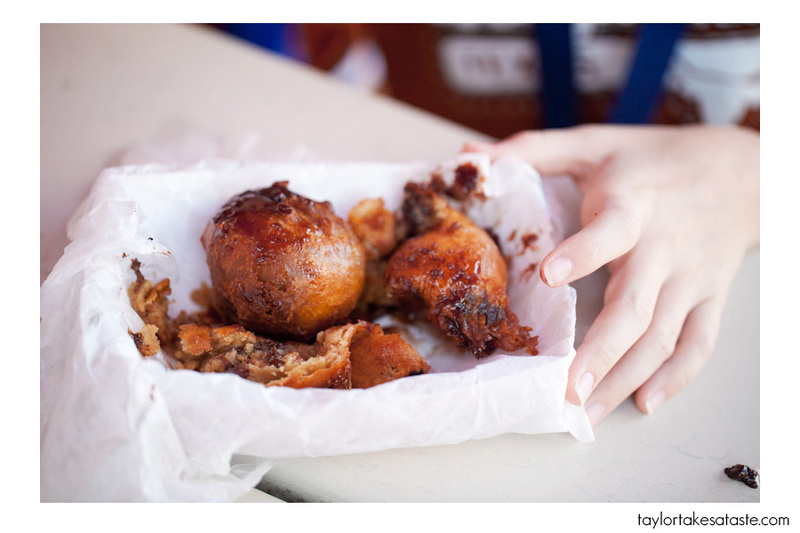 Earlier in the week, I brought you a post on the Texas State fair. 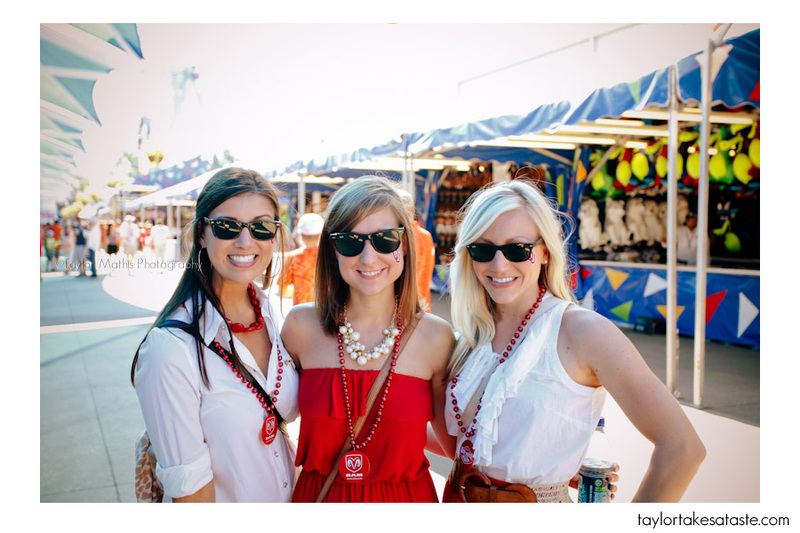 If you have never been to the fair, I suggest you read that post first. It will give you an idea of what the fair environment is like. Now that you are familiar with the fair, I want to explain more what the DART is. 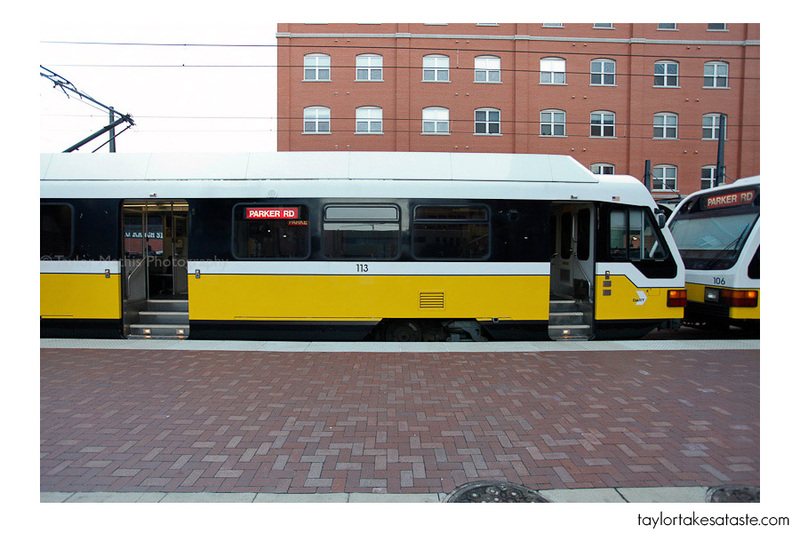 The DART (Dallas Area Rapid Transit) is the public transportation system in Dallas. It is how I was able to get from my hotel to the fair. 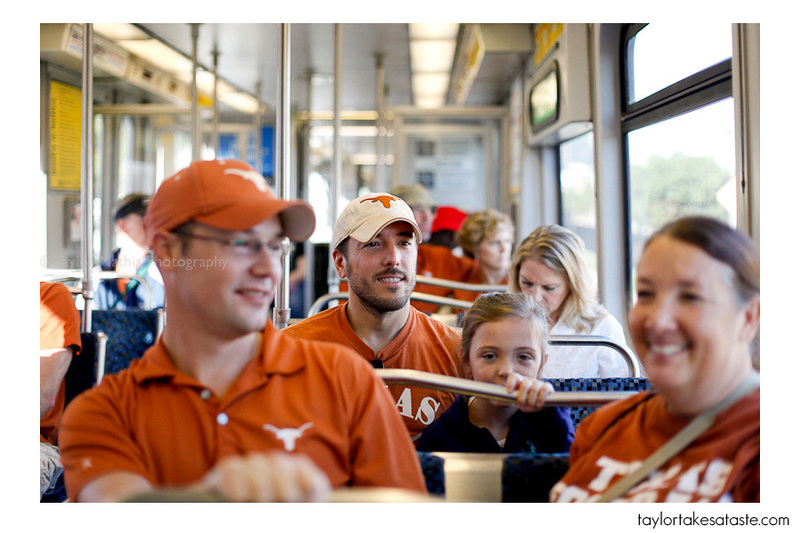 With parking being a nightmare at the fair on the day of the Red River Rivalry it is very common for fans to use the DART. 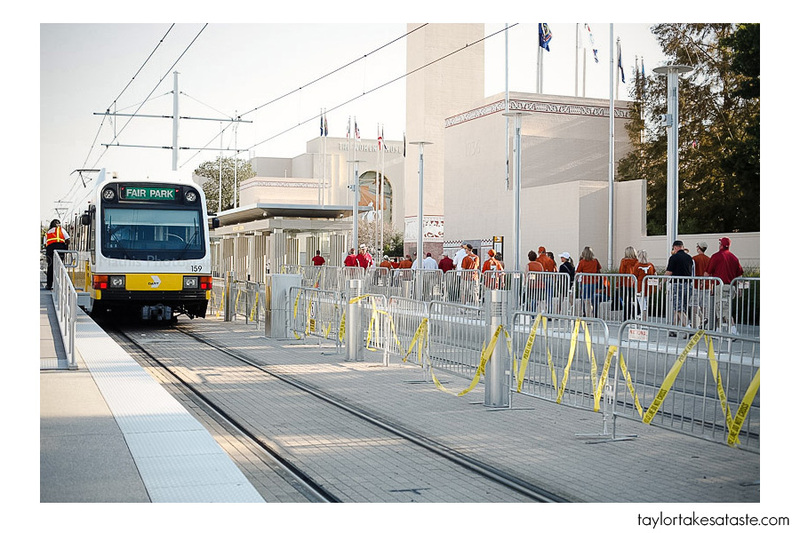 Last year there were huge problems with delays and overcrowding issues, but this year it seems that DART fixed any issues they had and everything ran smoothly. I was warned by my friend Sean, who is a Texas Alum and has been to this game 4 times, of a few things. The first was that this is an experience unlike any other and be prepared for one of the best experiences in college football. I was a bit skeptical, but before I go any further I just want to state that he was correct. 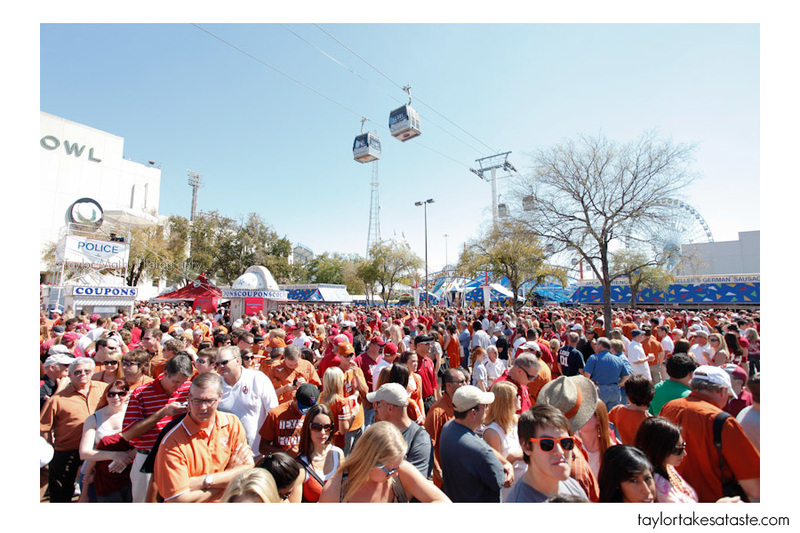 The atmosphere on the fair grounds on game day of TX VS OU is intoxicating. It is one of the coolest sporting experiences I have ever been a part of. 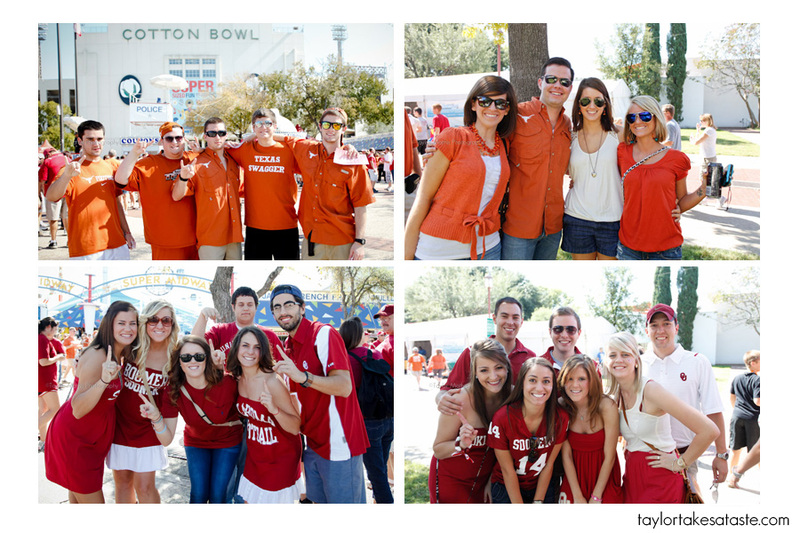 You don’t attend The red river rivalry it is something that you become a part of. Pictures can only bring you what I saw, what you gain in being their is the sounds of OU fans chanting Boomer Sooner and Texas Fans breaking out into Texas Fight! That combined with the smell of turkey legs, Corny dogs and every fried food imaginable makes this a unique stage for one of the best rivalries in sports. The Cotton Bowl seats 92,000 people, but there are just as many people if not more on the fair grounds that day not even going to the game. 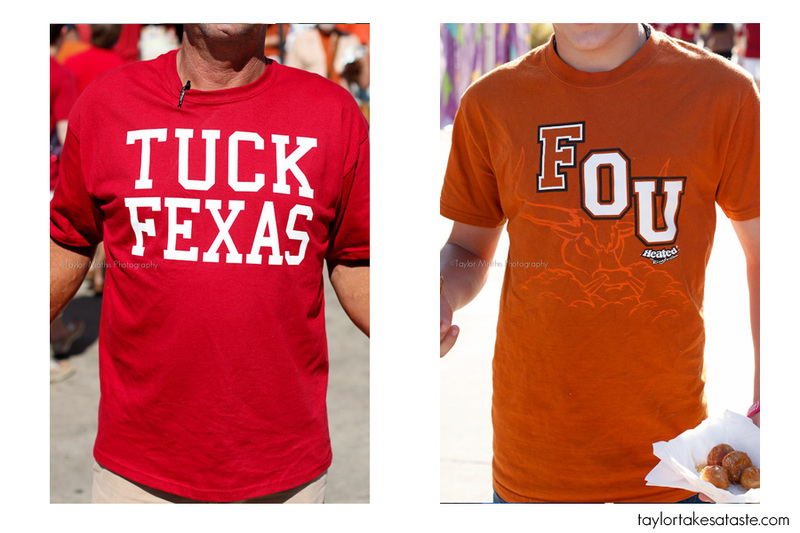 Everyone is wearing burnt orange or crimson. I claimed neutrality and wore Navy. Walking around with camera gear usually makes me stick out at Tailgates, but in this case wearing Navy made me look completely out of place. It doesn’t matter if you are a TX or OU fan, if you enjoy college football, appreciate tradition and want to see one of the most bitter rivalries in sports then being at this game is a must for you at some point in your life. 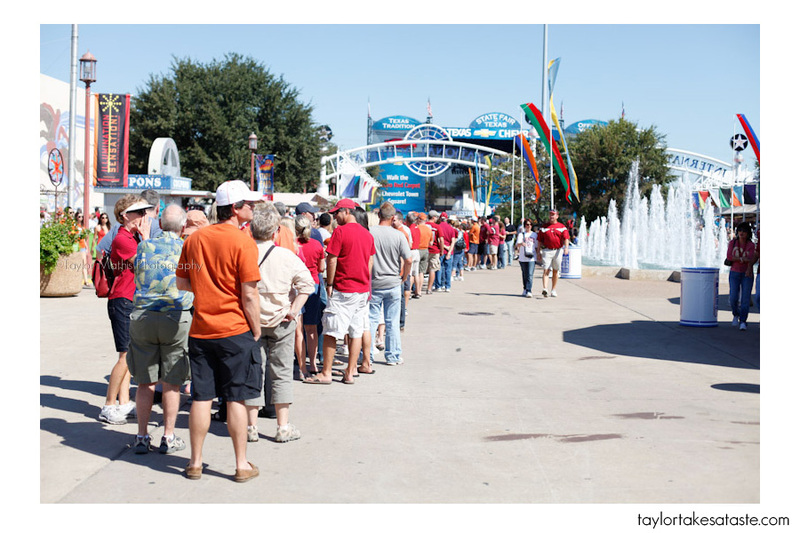 With that said I will walk you through game day at Fair Park. The DART will bring you directly to the Fair. If you are going to the game then your ticket acts as admission to the fair as well. If not then it is $15 to enter. 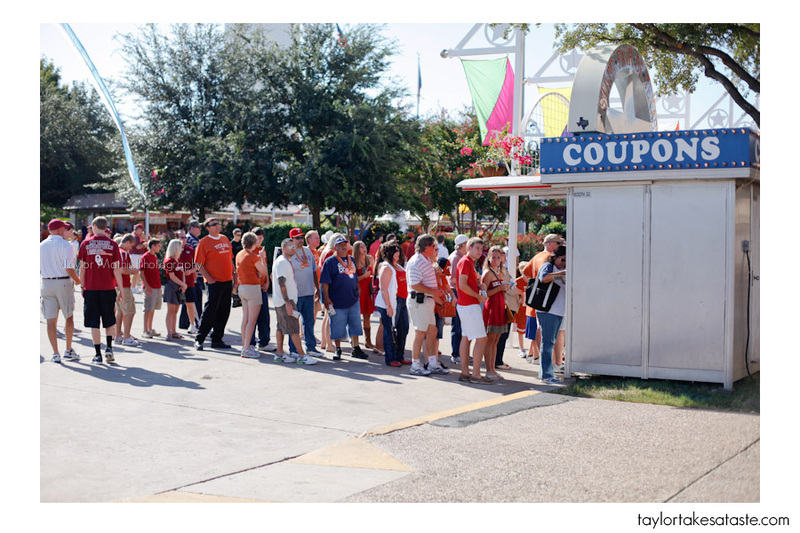 Another thing that Sean warned me about was how long the lines for coupons can be. Sean wasn’t kidding. I talked to people who stood in these lines for 45 minutes or longer. Why would you stand there so long you ask? Well, the coupons are the currency at the fair. On game day they are literally your ticket to….. If beer is not a part of your game day, then there is another alternative. You can use your tickets to try some of the most interesting and heart stopping foods you could ever come across. Earlier in the week, I showed you the Corny Dogs, Fried Beer, Chicken Fried bacon and all of the other foods I discovered on my first day at the fair. There is one that I was searching for, but couldn’t find until game day. Other than the fried beer, this was the food that I was most looking forward to trying…………. Upon seeing this purple banner I had found it. Fried Butter! Hmmm absolutely no nutritional value, but it is one of the most interesting and unique things I have ever tried! 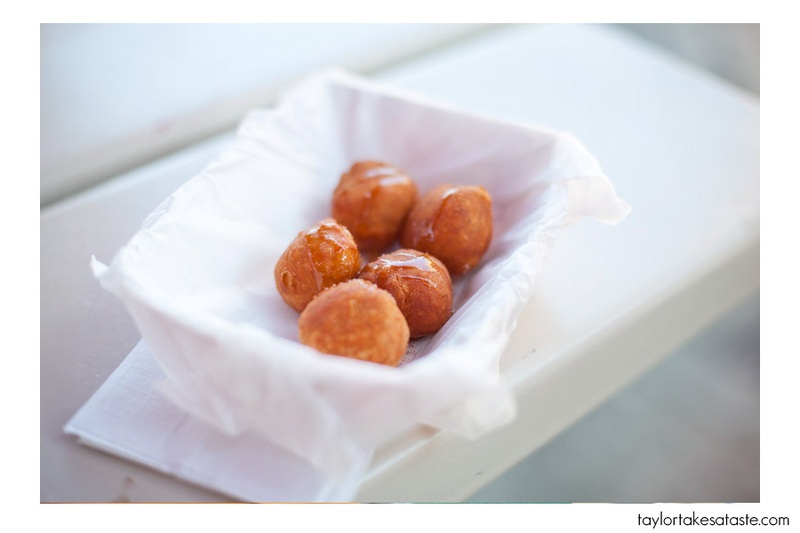 The fried butter is served in these little balls which are about the size of a hushpuppy. I had mine topped with cinnamon, sugar, and honey. You can also go with Cherry or Garlic. You might be wondering, “How can you fry butter?” The same thought ran through my head. Now that I have eaten it, I have an idea of how it is done. A frozen butter ball is wrapped in dough and then deep fried. The dough cooks in the oil while the butter is turned to liquid on the inside. 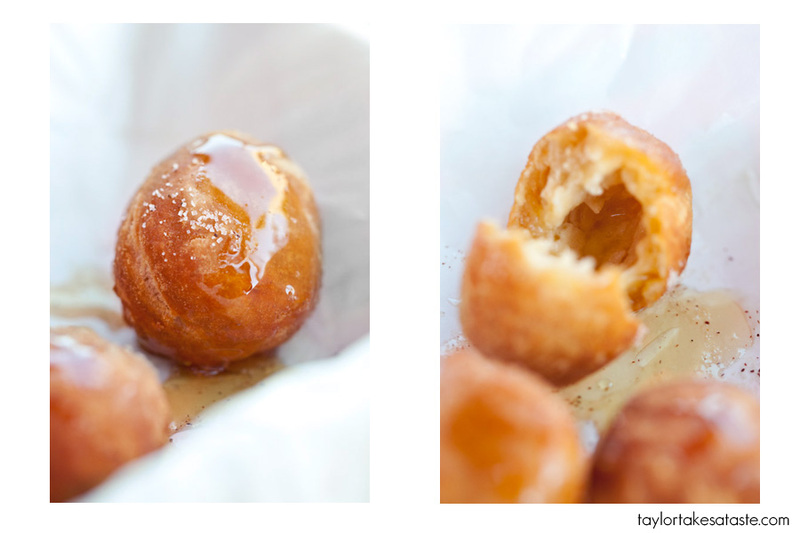 The result is a delicious fried outside (think like a doughnut) and a liquid butter surprise on the inside. Be careful when eating. On one bite butter exploded everywhere. The result of all of this is amazing. Probably one of the unhealthiest things I have ever had ( chocolate covered bacon, doughnut chicken sandwich are a few things I have had). Unlike the Fried Beer, the fried butter did not disappoint. 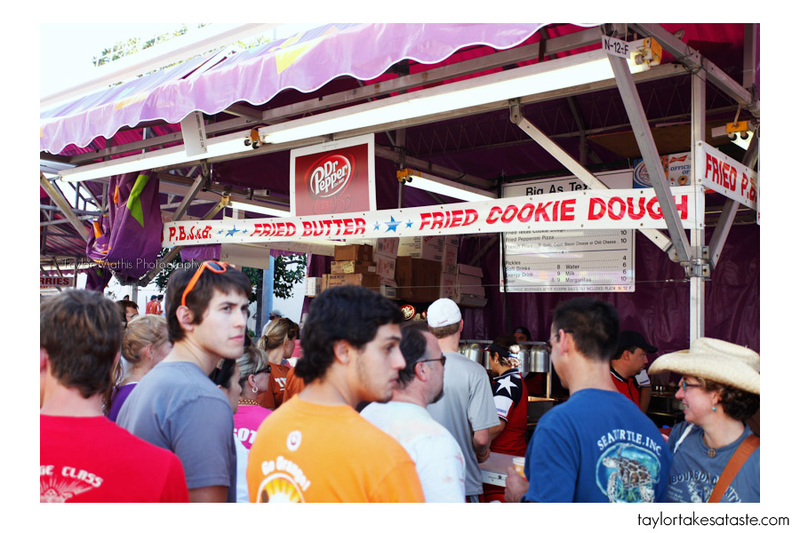 I didn’t try this, but at the same booth as the fried butter there was also fried cookie dough. Looks pretty delicious as well. While walking around the fair grounds, it quickly became evident how much these two teams dislike each other. 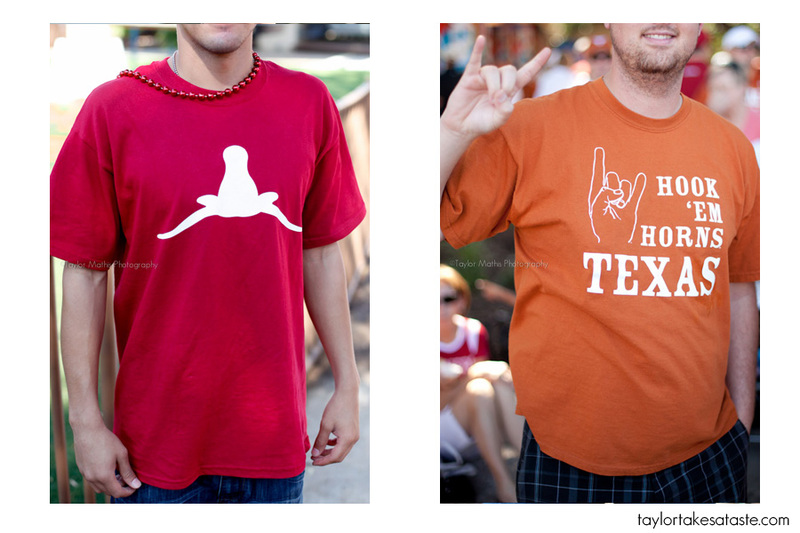 Here is a collection of shirts that I found amusing and will give you a better understanding of these two teams true feelings for one another. Oklahoma is located in Norman and Texas is in Austin. I spent a week earlier this year eating my way through Austin. Amazing food down there! I have yet to go to Norman. 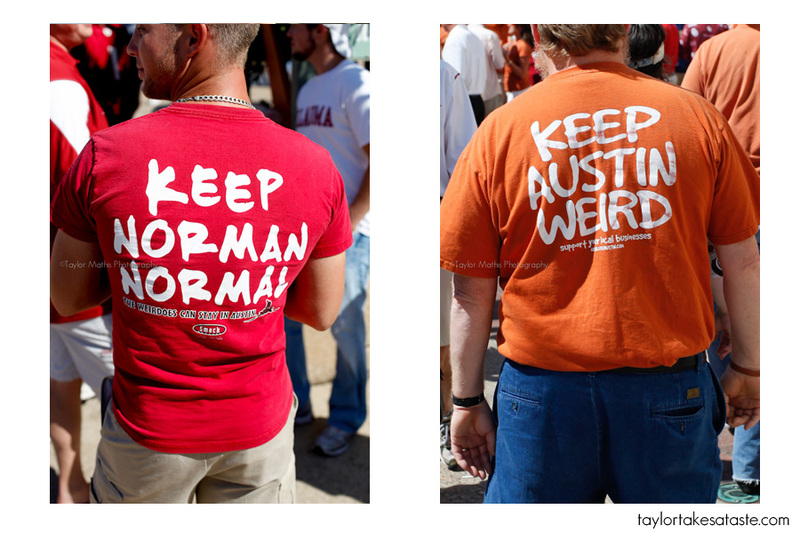 Austin has a slogan, “Keep Austin Weird”. It is part of a campaign to support local businesses. 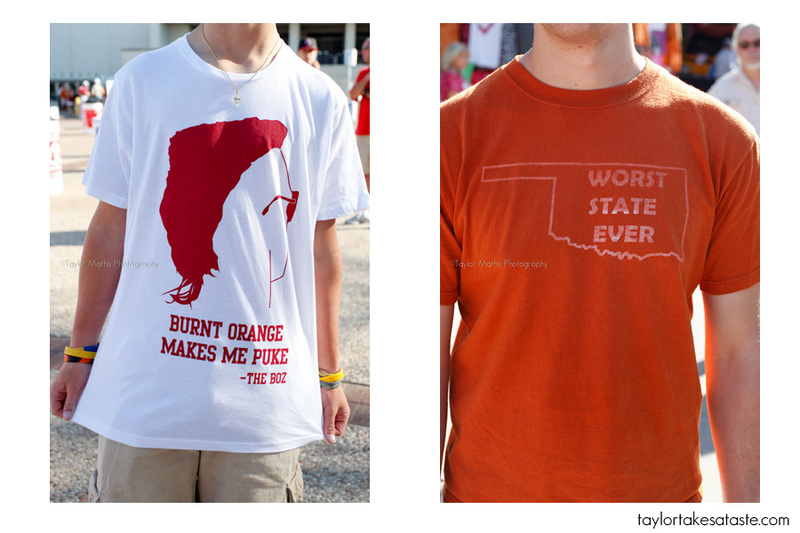 Oklahoma fans are making fun of it with their shirts. 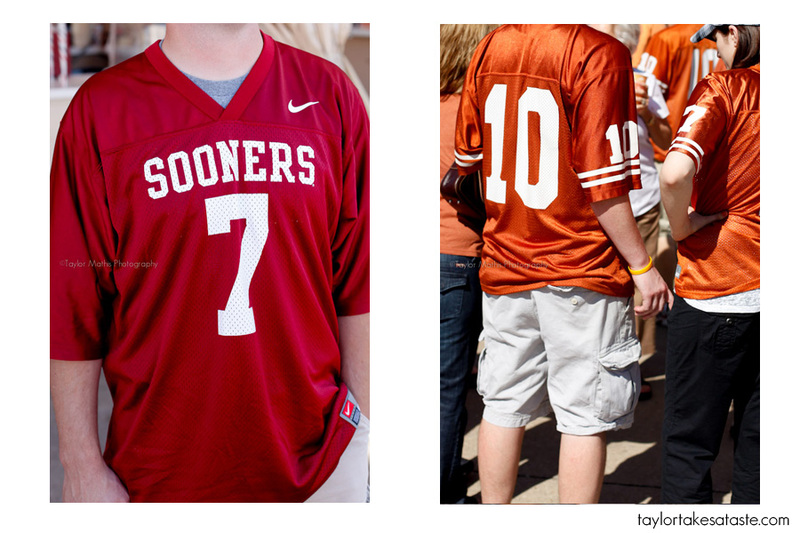 You might be wondering why all the Oklahoma fans have their hands with two fingers pointed down and the Texas Fans have the opposite. 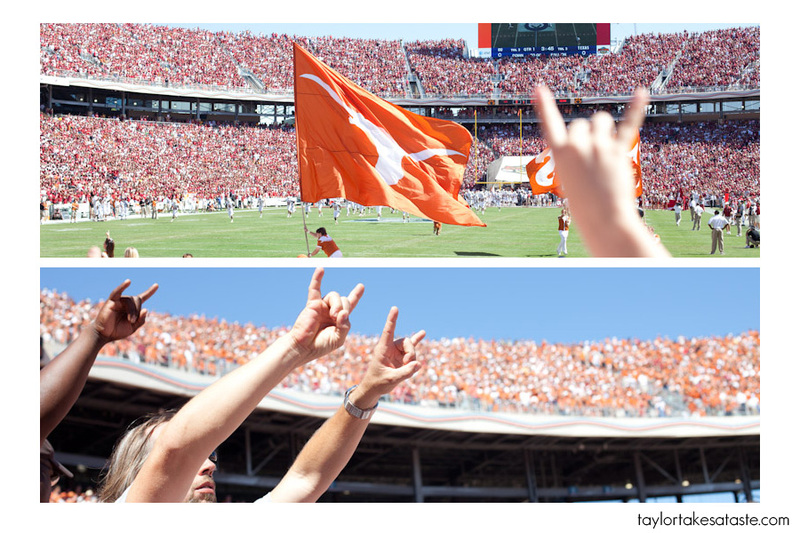 Hook’em Horns is a gesture preformed by Texas fans where they form their hand into a shape resembling a longhorn. 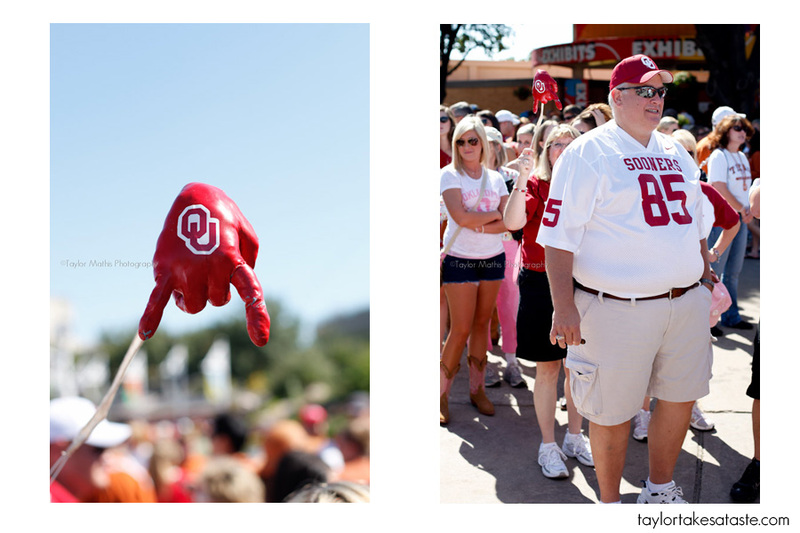 As a sign of disrespect, Oklahoma fans turn the horns upside down. 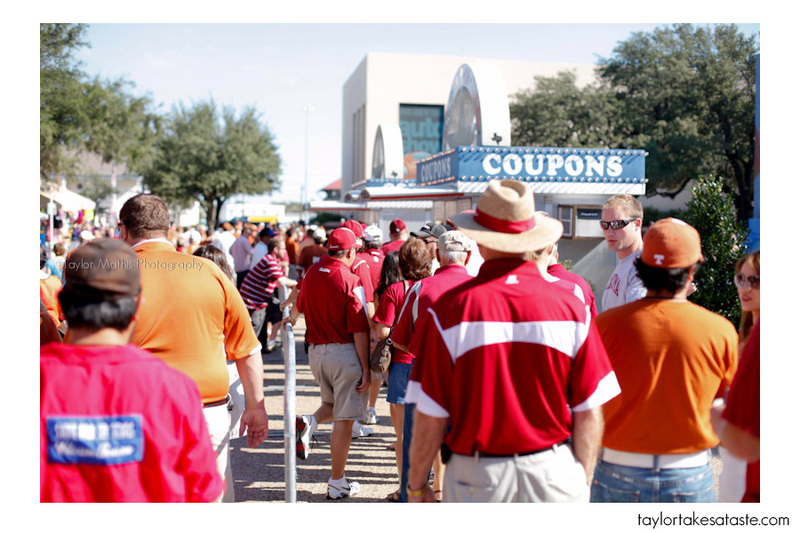 This sea of crimson and burnt orange covered the entire fair grounds. T-shirts were not all that people would wear. 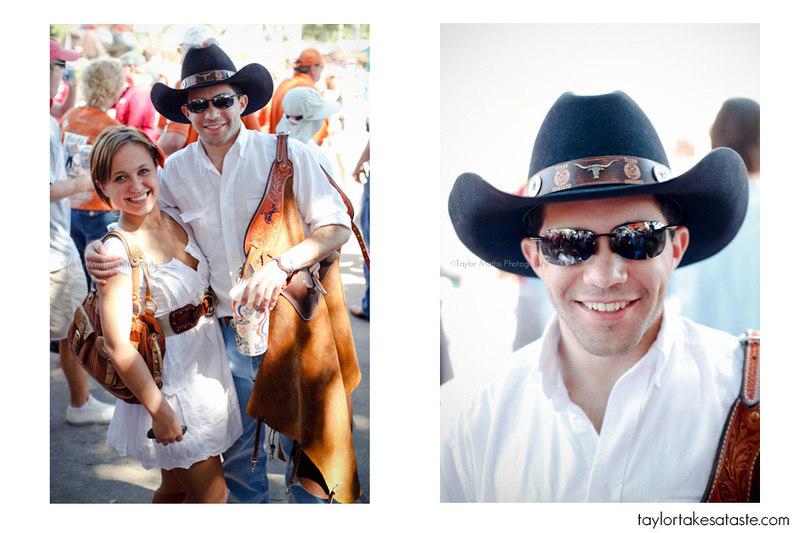 Similar to what I found at Ole Miss, girls at these games were dressed in sun dresses and cowboy boots. 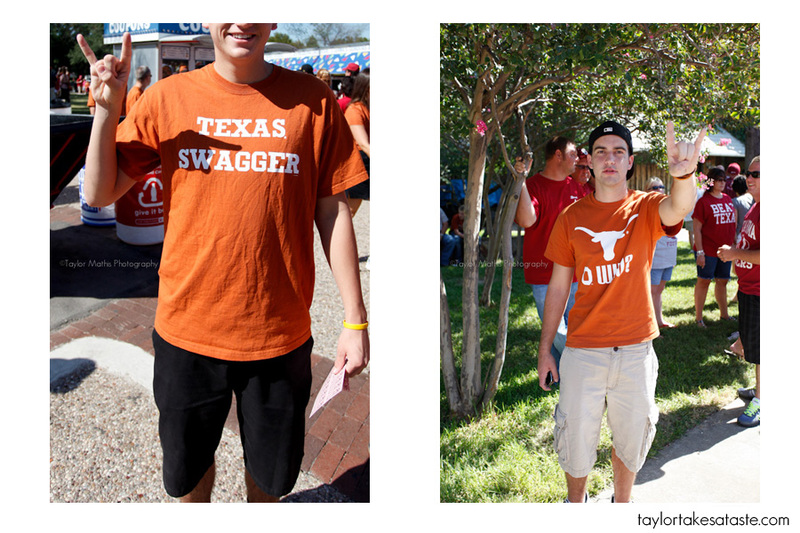 Regardless of whether they were in crimson or burnt orange, there was no shortage of beautiful fans at this game. I also ran into one of the Texas Cowboys who was nice enough to let me get a picture of him. 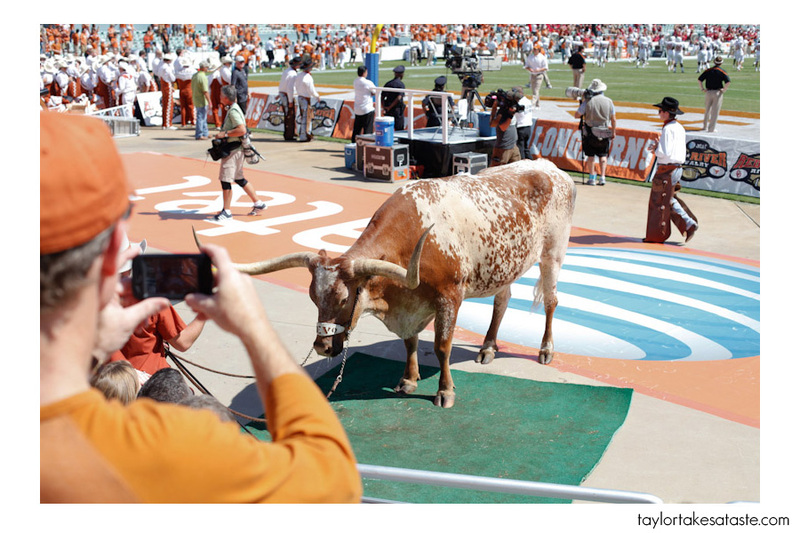 The Texas Cowboys is an organization on UT’s campus that do a lot of things, but on game day they are responsible for firing the canon on the field. 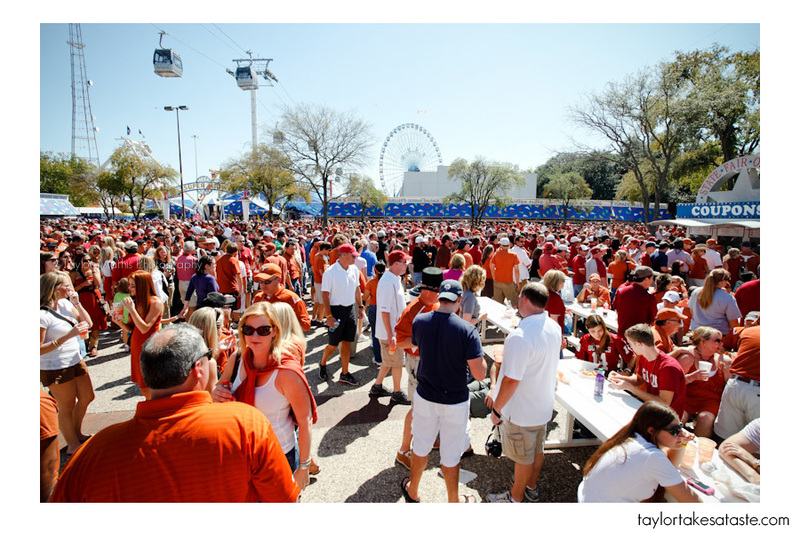 I have no idea how many people were on the fairgrounds on game day. There were 92,000 at the game, and easily the same amount or more outside the stadium. 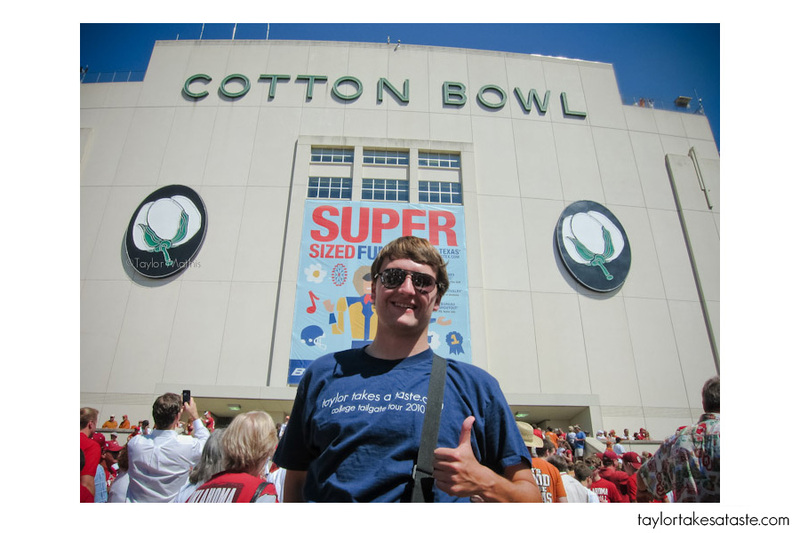 Of course when you are at the Cotton bowl you have to get your picture in front of it. Here are some more shots to give you an idea of what the crowd looked like. (Notice how I don’t fit in with the navy blue). For this game I actually went to the game! Here is a view from inside the Cotton Bowl looking out. I sat on the Texas side. 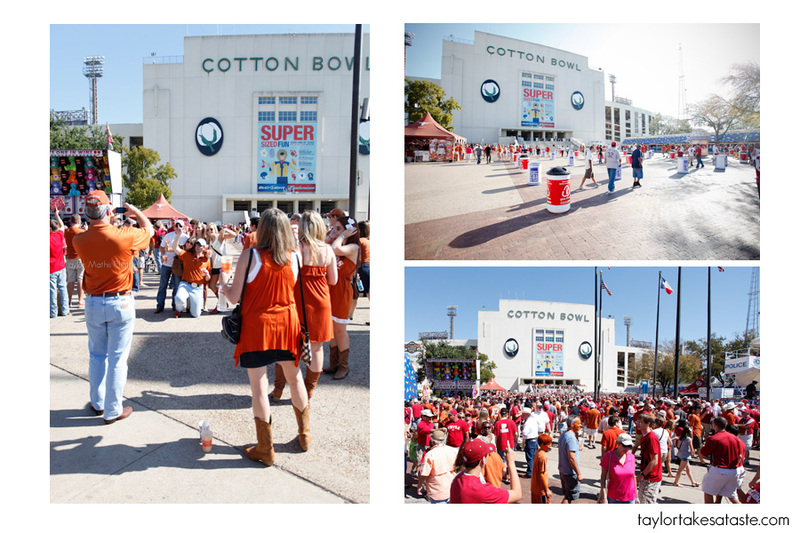 The coolest part of the Cotton Bowl is the split. 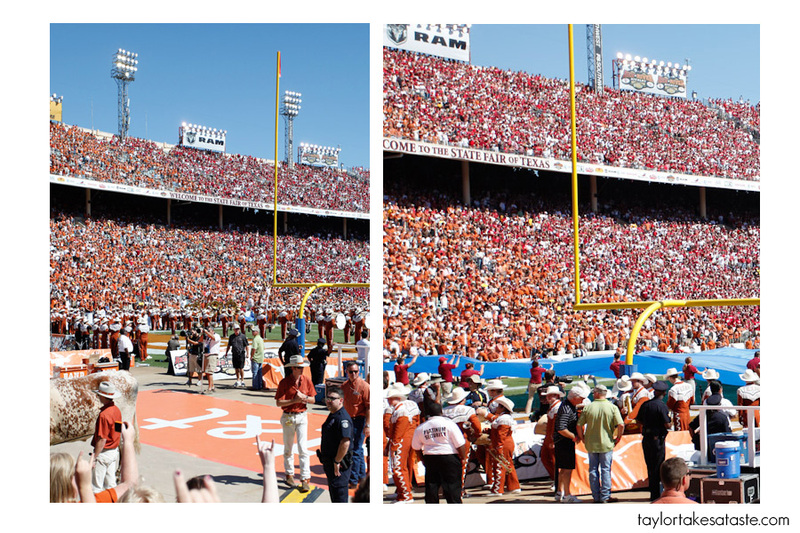 One side is a sea of burnt orange Texas fans and the other side is colored crimson with Oklahoma fans. You can see a distinct line where the two sides are split. This makes being at the game interesting. Usually in a stadium there is a dominant presence of a home team and a minority visitor team. 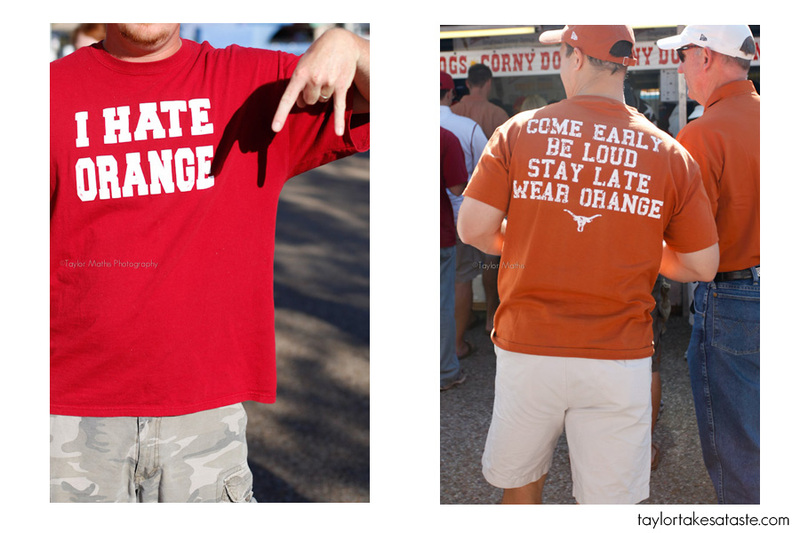 This is not the case at the Red River Rivalry. With the game at a neutral site, there is equal representation from both sides. When Oklahoma scores, half the stadium cheers! When Texas scores the other half erupts in applause. Each side is loud enough to have its own presence heard in the stadium. It is cool to watch the split after a big play occurs. One half will be standing with arms up rejoicing, while the other will have their hands over their faces in anguish. Words can not really explain it, it is something you have to be a part of to fully appreciate. Of course I had to get a picture of Bevo the mascot of the University of Texas. 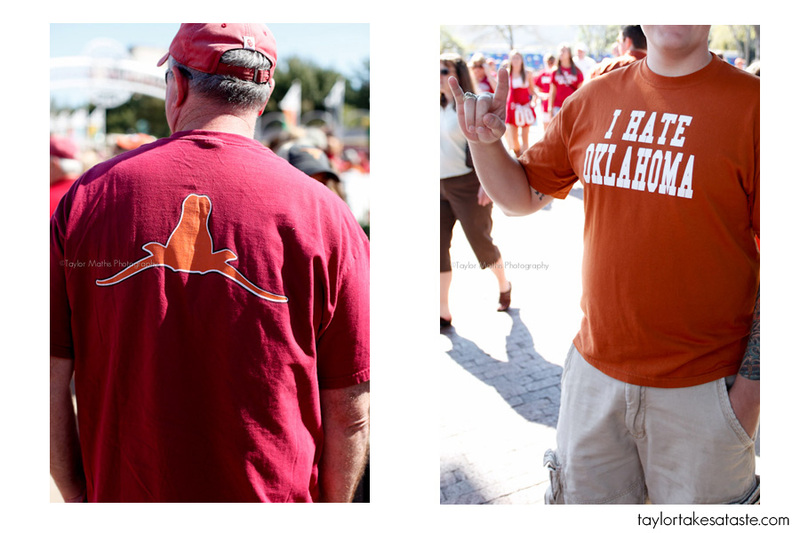 Despite the final score (Oklahoma won 28-20) the Texas fans were in full support of their team. It was a lot of fun to be apart of their cheers and flash the Hook’em horns. This game was unlike any other that I have been to on my tour yet. There are several things that make this game unique. First is the location. Every year the game is held in Dallas on a neutral site. I didn’t realize this ahead of time, but Dallas is about 3 hours north of Austin and 3 hours south of Norman. One team travels North in I-35 while the other team travels South on I-35. 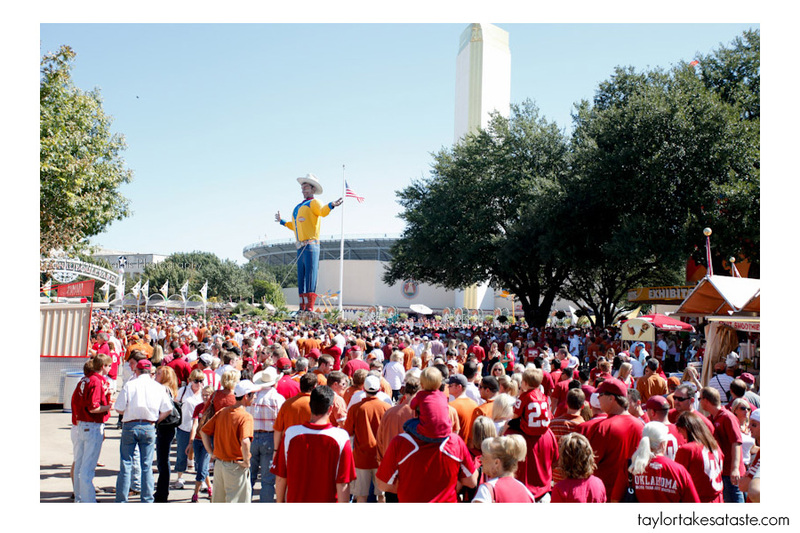 Well over a hundred thousand people come into town for this game, so you probably want to avoid I-35 on this weekend. With both schools being the same distance away from Dallas, there was equal representation from both sides at the game. I definitely saw an even mix between crimson ans burn orange. The second thing that makes this experience unique is that the Texas State fair is going on at the same time as the game. Not only that, but to get to the game you have to go through the game. I never made it out to the fair parking lots, so there might have been some tailgating out there, but why tailgate when you have all the fun of the fair as your tailgate! Where else can you have fried butter and corny dogs before the game? There are also games to play and rides to ride. This is not your average tailgating experience, but seeing the combination of fair and football makes this game the closest to an adult Disneyland that I can imagine. The third thing that makes this an experience and not just a game is the passion. 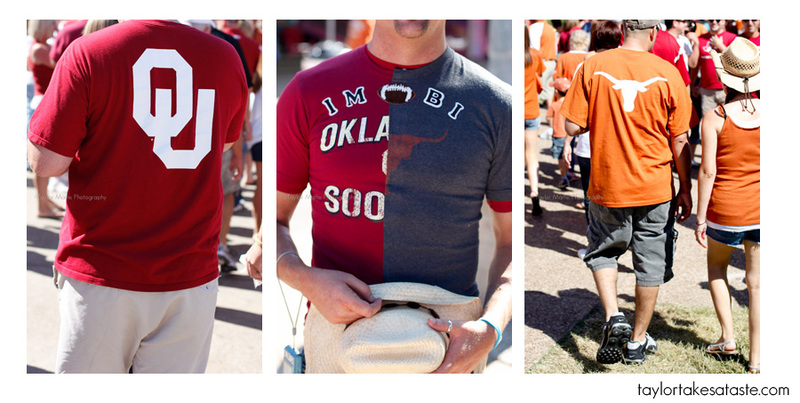 Texas and Oklahoma are equally some of the most passionate fans I have ever come across. They love their respective teams and go to extreme lengths to show it. I did not see any there, but I have heard of physical fights breaking out between the two sides. After the game you can only imagine the taunting that goes on from the winning side. My final thought is that with the historic rivalry, location, and environment, the Red River Rivalry is a football experience that is truly unique. It is almost in a category of its own. Regardless of who you cheer for, it you have the chance you definitely should make the trip to the Big D and experience the game for yourself. I have a bye week this coming weekend, but don’t worry I have a bonus tailgate for you next week! Wow! What an awesome post Taylor! You put such hard work into it – all these lovely ladies to photograph …tough job. I’m from Colorado, so there is just a little too much Texan pride on this page for my taste. But fried butter? Did I read that correctly? That is insane! 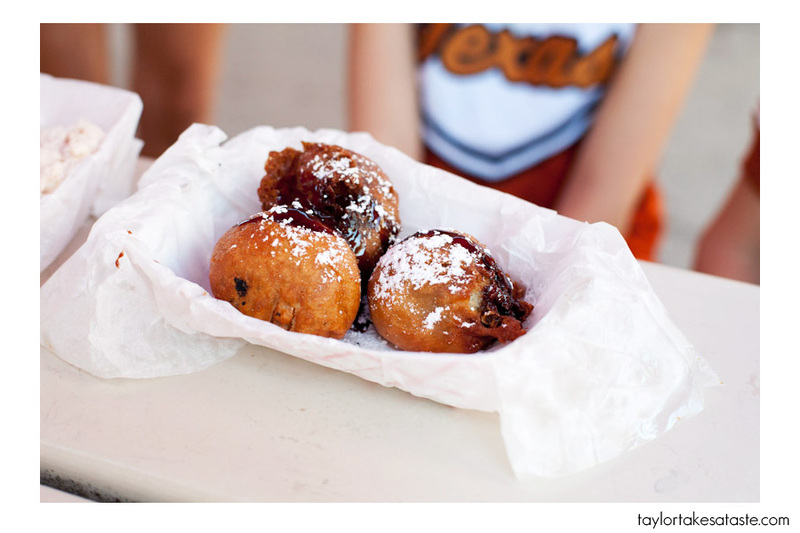 I came to see what fried butter looks like though I wanted to tell you that the photos of everything are marvelous. Think I’ll steer clear of the butter though. 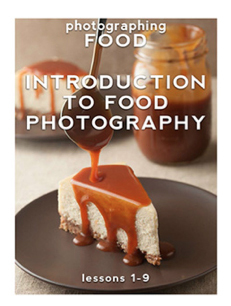 Love this post, but of course I’m an OU fan and when you mix food blogging with OU football, I’m going to LOVE it. 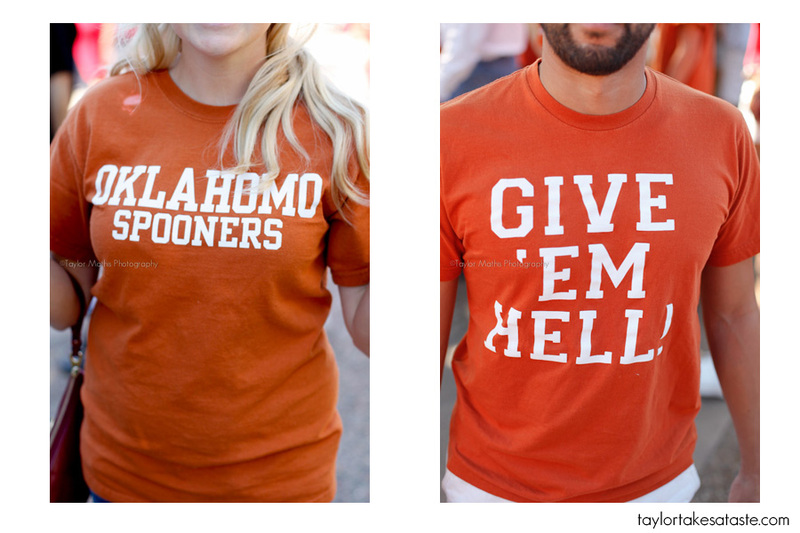 You didn’t mention that Texas got their A$$es kicked by OU. How could you?? Welcome to my neck of the woods mate. You missed out on the cookie dough, but at least your had a deep fried ball of butter to save face. Keep up the photo football glutton tour mate. I really enjoy your photo’s. If you are ever around Atlanta you need to give your fans at Jackson Spalding a hollar. Fried butter! Now, I’ve seen it all. 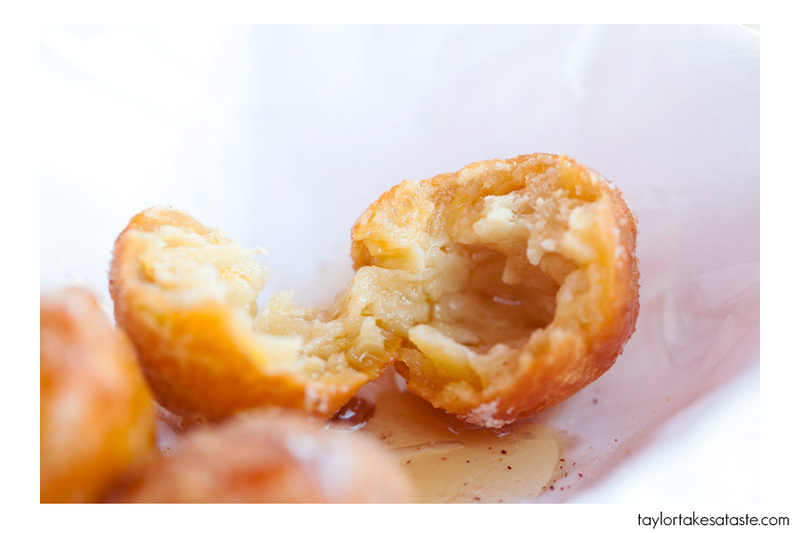 So, I take it they are like little donut holes filled with cubes of butter that turn liquidy when fried? Awesome! Love the pics of food and the fair!! I’m glad you enjoyed Texas. I live in San Antonio and work in Austin. 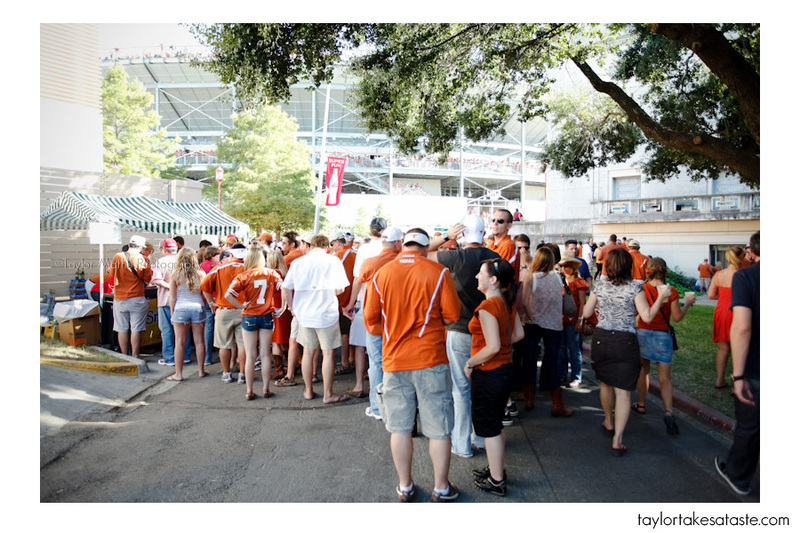 And yes, you are correct, the fans are extremely dedicated to UT! I hope you can make it down to SA and the Riverwalk. 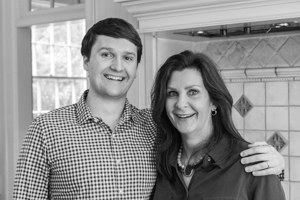 I also suggest, if you like, to try some local mom-and-pop mexican restaurants. The best are on the westside of SA. You won’t be sorry!! What an amazing post, Taylor! 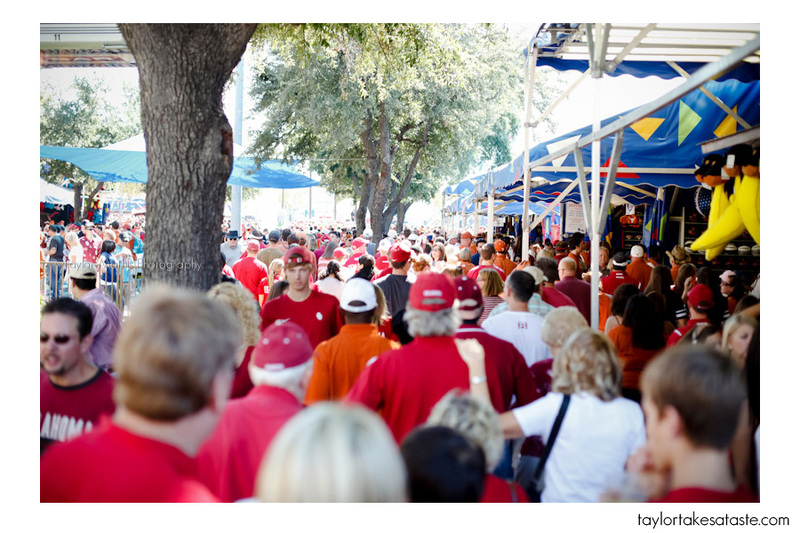 Although we are HUGE OU fans – this was also our first Red River Rumble experience and your post describes it perfectly!!! So glad you enjoyed it just as much as we did and we are so proud of our Sooners for the win!! 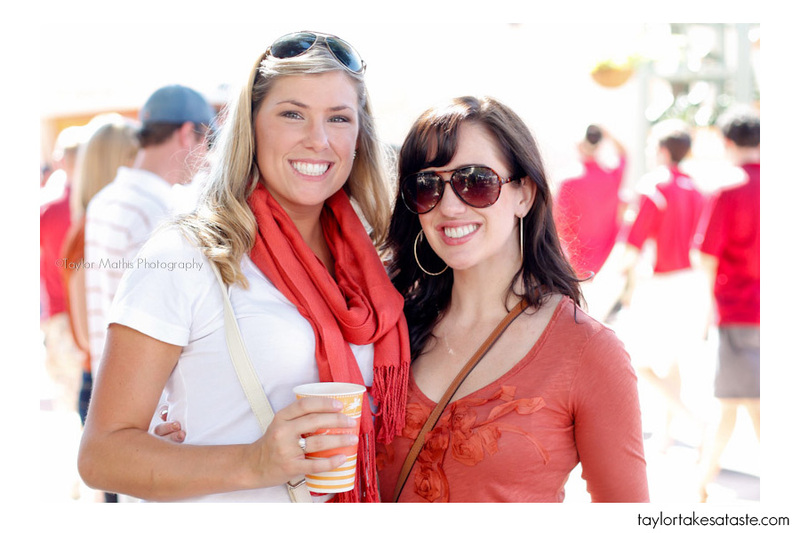 Thanks for capturing some amazing pictures of the fair, fans and game!!! BOOMER SOONER! Fried butter sounds soooo wrong and yet so right! Yummy! I’ve been reading your blog for a couple of months now & I have to say it’s now one of my favorite food blogs! 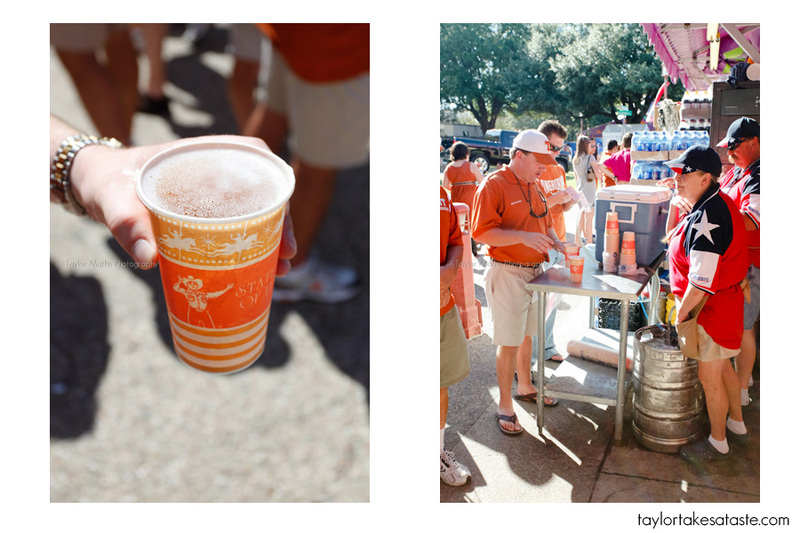 If you hadn’t embarked on this tail-gating tour I would have never known what it was! As a Londoner, you can imagine what a culture shock it is but I’m a little sad my university has nothing like this to offer! I love this post! 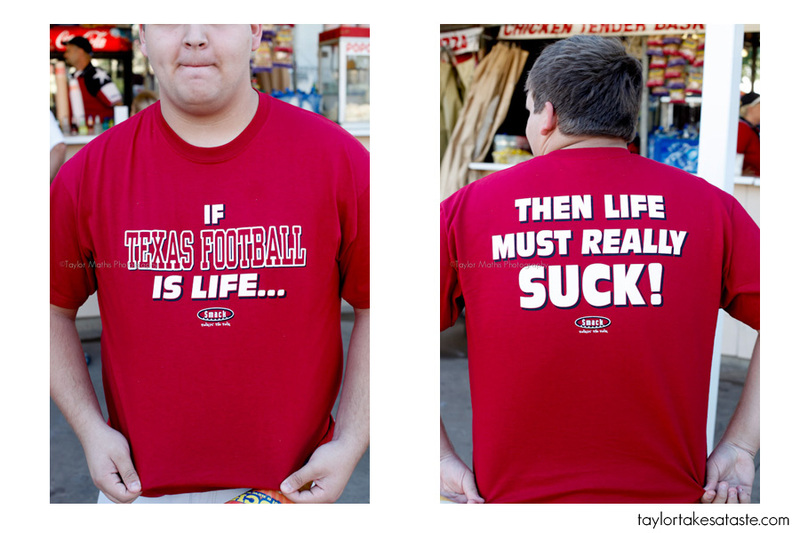 I live in Dallas and I try to either participate in OU/TEXAS weekend or get of town. The fair food is pretty fun and I love all the new cerations everyone comes up with every year. 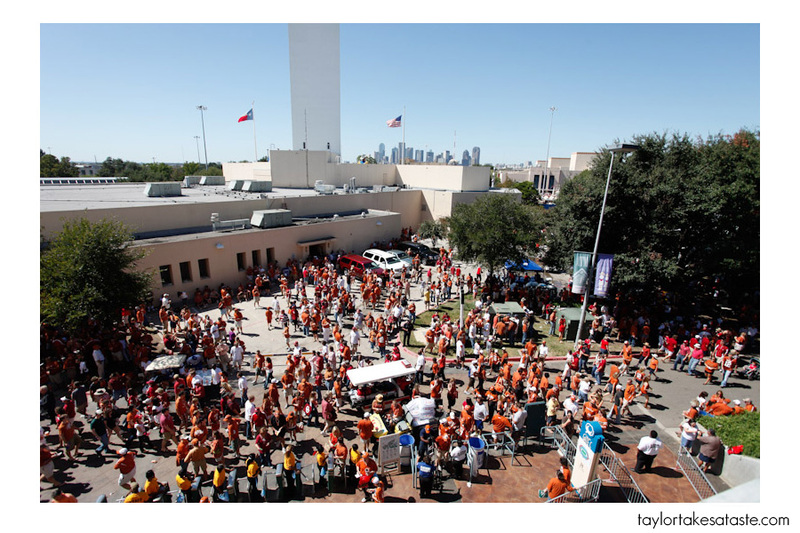 Beautiful photos – you defintely make Fair Park look much pretty than it really is! Great post! I have so many fond memories from the Red River Shootout in my college days. Now I need to take a trip back for a fried foods tour. I love all these shots you’ve got here, especially documenting all those shirts. It makes me feel right back at home. Hook ’em!